Sorry for the absence the last few months. Last year was a busy year for us. Between the release of our children’s book ‘Farmer Pete Has Stinky Feet’ (affiliate link) and finishing up the final touches on our next book, it has been hectic. We are happy to be back though and are ready to start painting and crafting with you all again. And what better way to kick off our return with a colorful and easy spring painting for the kiddos. 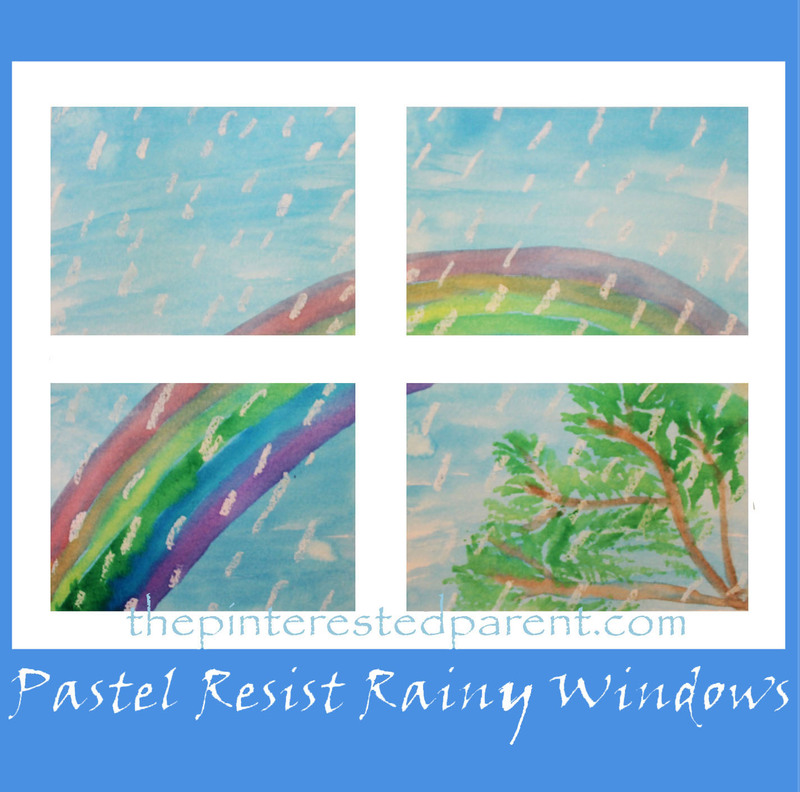 These pastel resist rainy windows are perfect for the spring. We are expecting our first snowfall tomorrow. There are very few things as beautiful to me than the first snowfall of the year. Just the thought of snow, made me giddy and inspired this fun and pretty art project for the kiddos. We live in the woods, so I just wanted something that looked like our backyard after a snow storm. This is an easy painting project that will be fun for kids to adults. I think they will love how the pastel resist and the watercolors work together to make these simple winter scenes. This weekend I took my daughter and my niece apple picking. Alongside the rows of apple trees were sunflowers as far as the eye could see. Those pretty sunflowers were the inspiration for our latest landscape painting. This field of sunflowers is perfect for the fall, super easy to make and looks just beautiful. Get your paint brushes ready little painters. This is going to be a fun one. This adorable leaf bunny nature craft is perfect for the springtime and Easter. We have a rhododendron bush in our front yard. I love the leaves from that bush and pick them off often to use for arts and crafts projects with my daughter. The last time we worked with them, my brother-in-law stopped over and suggested that we could make Easter bunnies with them because the leaves looked like bunny ears. Brilliant! Now why didn’t I think of that? Either way, I used his great idea and made this adorable leaf bunny. We recently inherited a large bin filled with potpourri fillers. My daughter & I were so excited at the opportunity to use them in our crafts. We started a few days ago by using them to make salt dough and nature wreaths. We also formed some lovely winter wonderlands. While making our wonderlands and playing around the potpourri, we came up with another idea for the season. The potpourri that were used were cinnamon pine cones, cinnamon sticks, star anise, pink roses and some other items that I am not sure of, but I am sure many potpourri fillers or herbs will work nicely. When you do arts and crafts as much as we do, friends and family will randomly give you materials that they think that you can craft with. I recently inherited a large jar of corks from my mother-in-law. We dug into them once already to make carolers for Christmas and then last night after watching the ‘Polar Express’, I dug into them once more to make a train. My daughter had a very busy week. This week she had soccer practice, swim lessons and her first acting class. The week must have tired her out because when the weekend came, she asked if she could have a pajama craft day. How could I say no to that. A pajama craft day sounded fantastic. We have a younger friend of the family that loves craft time at our house, so we invited her over for pajama craft day as well. They wanted to do something Halloween themed. My daughter said that she wanted to make ghosts and mummies. I wanted to keep it simple for our younger friend, so we made what we dubbed “Splat Painting”. It was not quite a splat, but more of a free form painting turned into a cute Halloween craft. The kids used acrylic paints and painted onto their pieces of paper. They painted white for ghosts, black for black cats, orange for pumpkins. They sprinkled glitter over their paintings because they found my glitter stash and kids just love glitter. We cut simple shapes out of construction paper for each of our creations. The girls glued the shapes and googly eyes over each of their paintings to form their Halloween creatures. Here are some of the creations that we came up with. How cute are these? The girl’s did a great job with their paintings. These were so much fun to watch them make. We are huge fans of hand, foot & finger printed projects. They are fun to make & some of those sweet little prints make for wonderful keepsakes to save & look back at later. My daughter is going through a little bit of a monster phase lately. She loves to draw them and make clay sculptures of them, which is funny because she doesn’t like anything scary, but she always makes sure to tell me that they are nice monsters. Monsters are simple & fun to make and have so many possibilities. We made some adorable & “nice” monsters this week with our thumbprints. My daughter picked out a few different colors of acrylic paint & we squeezed out just a bit of each onto a paper plate. I explained to my daughter that after she dipped her finger in the paint, she needed to blot off a bit of it before pressing onto the paper. She blotted her fingers & pressed firmly onto a sheet of white paper & then we set the paper aside to dry. Acrylic paint dries rather quickly, so we were able to work with our thumbprints without much wait. I drew a couple of starter monsters onto the thumbprints & my daughter quickly grabbed a Sharpie and went on to finish the rest of her thumbprints. I took this photograph of her as she drew, but she insisted that I do not look until the end, so she asked for privacy while she worked on the rest. A true artist never wants to reveal their work until it is finished. When she finished her last one, she proudly ran over to me to show me her friendly monsters. They were so cute. She pointed all the differences out to me & told me that she likes her monsters to have tails. I made some of my own & thought the tails were a cute option for some of mine as well. We also recreated a thumbprint idea that we made a couple of year’s ago. We used all of our fingers for this one to form spooky Halloween eyes. I showed my daughter how to press both fingers down on the paper at the same time to form the eyes. She alternated fingers to make different sized eyes and since the angles and shapes would vary with each pressing this made for a great variety of eyes. Our spooky eyes were fun & will be a creepy addition to our front window. My daughter is obsessed with balloons. 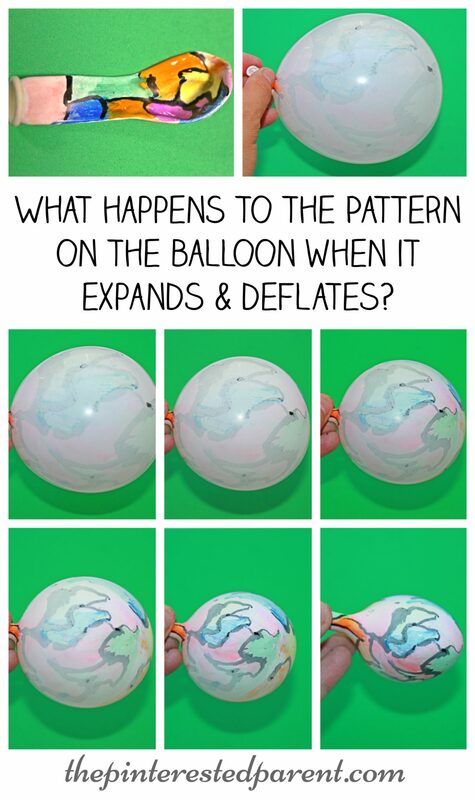 There are balloons bouncing around our house most of the time. We have bags of them & she asks me to blow up new ones for her all the time. Yesterday, she picked up one of her balloons & started coloring it with a marker. Looking at her colored balloon gave me an idea. I grabbed one of our noninflated balloons and used markers & sharpies to color in a design. It did not need to be anything elaborate, just a quick design.